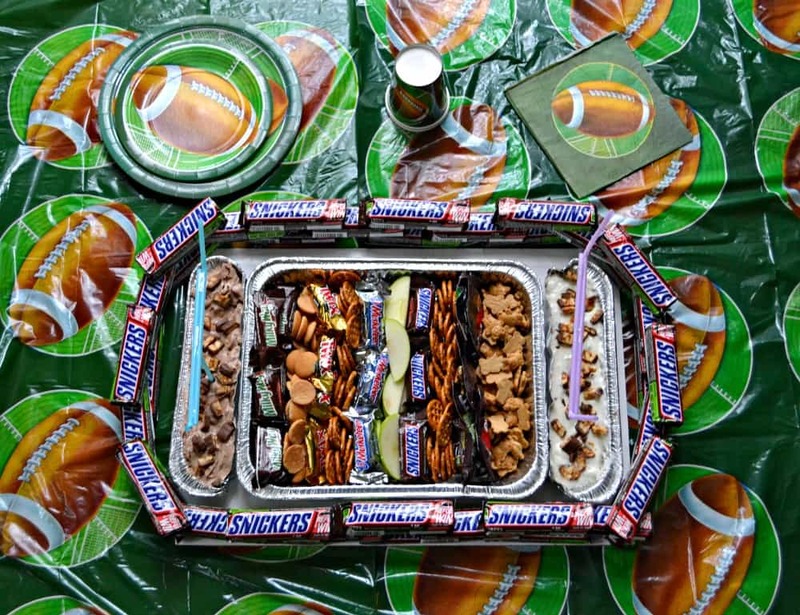 SNICKERS® Stadium, SNICKERS® Dip, and Dippers! It’s finally here! Are you ready for some football? You know everyone in this house is! Whenever there is football on TV you can find my husband and I watching it while munching on some serious football snacks. The more people that come over to watch the more outrageous the football snacks get! 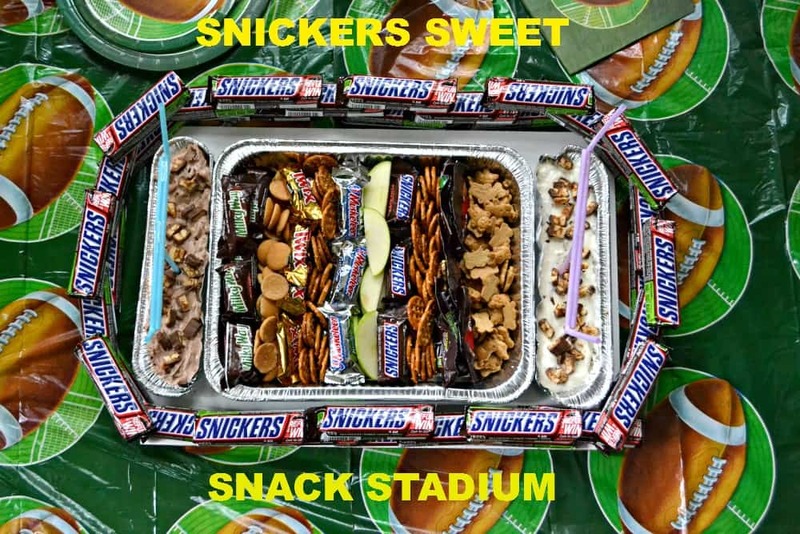 I can’t wait to share with you my latest creation, the SNICKERS® stadium with SNICKERS® dip and dippers. This may look like a snack that takes a long time to make but I was able to put this bad boy together in under 30 minutes. 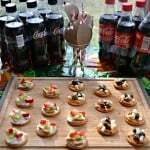 I’ve been wanting to make one of those Snack Stadiums since I’ve seen them but some of them have so much food and I know much of it gets wasted. That’s when I had the idea for the SNICKERS® stadium. My thought was that I could take the large SNICKERS® bars still in the wrappers and build a stadium out of them. That way people could grab them and munch as they wanted but if we didn’t eat them all, they’d still be in the wrappers and we could use them as snacks for the next football game! Then I had to think about what to put inside the stadium. 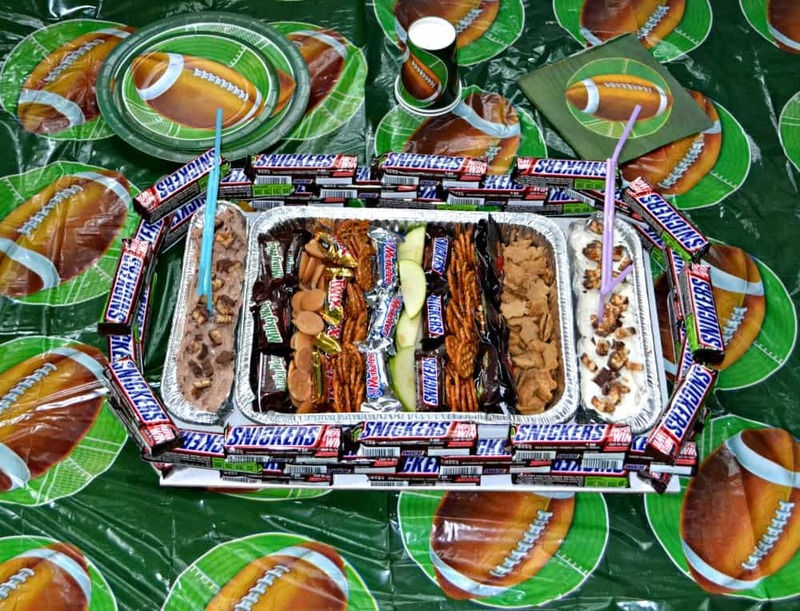 I wanted to go with a sweet snack theme so I made a yummy SNICKERS® dip for the end zones and then put ten rows of dippers in between the end zones to represent 10 yards each, or a 100 yard football field. Thinking about the dippers, I again didn’t want a lot of waste. I went to Sam’s Club to get the 48 count SNICKERS® bars and while I was there I saw the Mars 105 variety bag of candy bars. I thought they would be the perfect dippers and since there were 5 varieties, that ended up being half of the dippers! I filled in the remaining 5 slots with cut up pound cake, strawberries, pretzels, graham crackers, and apples. I thought that would be a good balance of dippers and something that everyone would like. I made the base of my stadium with 2 foil pans. I used one for the dippers and one for the end zone. The end zone pan I cut and half and then folded up the edges, cut the excess, and then pushed against the stadium. It took 5 minutes to make but be careful because the cut edges of the foil pans are sharp! Next I made the SNICKERS® dip. Ok I actually made two different ones, but the only difference is the base of one is chocolate and the base of the other is vanilla. Otherwise they are exactly the same. I put that into the refrigerator to chill why I built my stadium. 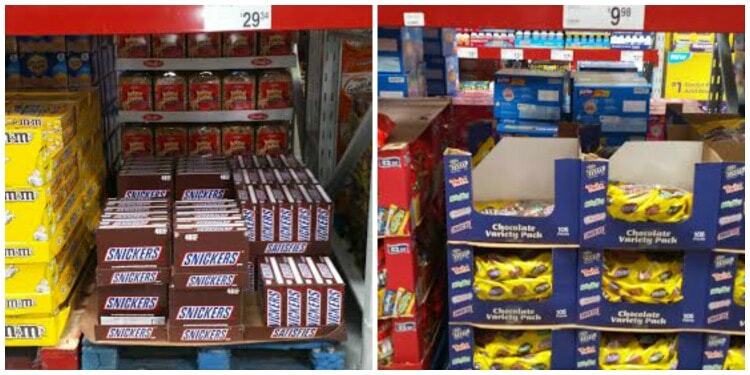 Surprisingly, the large SNICKERS® bars easily went up as stadium walls. I use 12 as a base then staggered 12 more on top of that, and 12 more on top of that. I ended up using 36 of the bars to build the stadium. Then I filled the foil pan with the dippers. 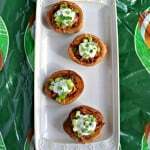 Once I was ready to serve it I put the dip in the end zones and served! 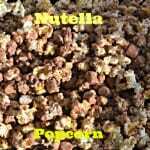 This made for an easy and super fun football snack. Everyone loved the SNICKERS® dip and the treats. I had a lot of compliments on its creativity and people kept asking me how long it took to make. I kept that information to myself. 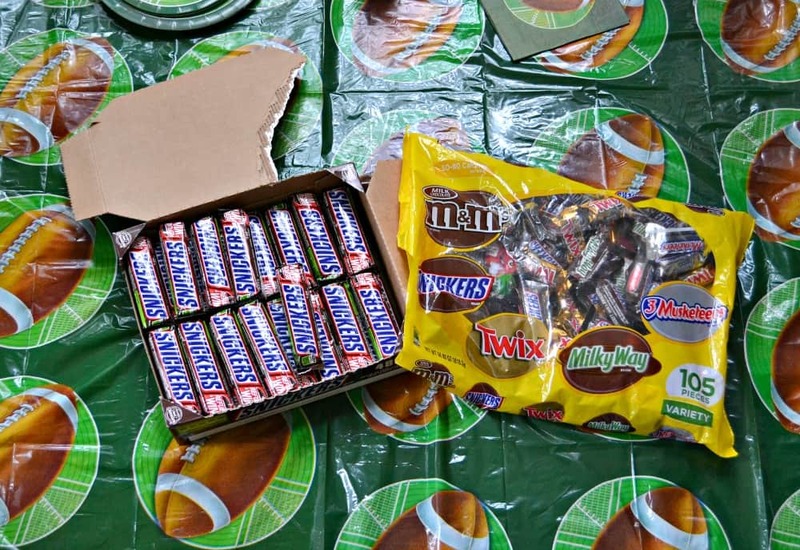 So when you have a football party this year, think SNICKERS® stadium! 1. Place one foil pan in the middle of a cake board. 2. Cut the other foil pan in half. Fold up the cut edges to make the dish for the end zones. Cut off any material that isn’t needed. Place one end zone one each side of the foil pan. 3. Take 12 SNICKERS® bars and set them up so that they circle the “field”. Place 12 more bars on top and then 12 on top of those, staggering each layer so that it is strong enough to stand up. 4. Fill the middle foil pan with 10 different dippers or alternate 2 different dipper 5 times. 5. Take 2 straws and place them next to each other, facing opposite ways. Make sure the bendy part is facing up and tape them together. Place the straws on top of a third straw, forming a goal post, and tape. Repeat with remaining straws. 6. Once the dip is spread into the end zones, place one goal post into each dip. In a large bowl combine the cream cheese, powdered sugar, and whipped topping. Mix until combined. Add enough milk to slightly thin the dip. Fold in 4 of the chopped SNICKERS® bar. 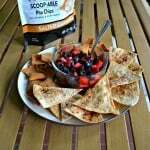 Divide the dip in to 2 bowls. Add the vanilla to one and the cocoa powder to the other. Mix each dip and then spread one into each end zone. Sprinkle with remaining chopped SNICKERS® bars. Those Snickers look so good. Me and hubby are trying to lose weight though. My kids would love this. Awesome! I LOVE Snickers! And I’m coming over the for the next game for this! I haven’t heard about “stadium” trays before. Fun idea! Snickers Dip! That sounds amazing.